Japan's GDP: Has the Tide Turned on Abenomics? The latest GDP figures for Japan suggest Abe’s policies may be approaching a critical point. Critics of Japanese Prime Minister Shinzo Abe’s reflationary policies have had a week to savor. After jumping on reports that the nation’s gross government debt had hit 1,000 trillion yen ($10.3 trillion) for the first time ever, on Monday came news of below-forecast economic growth. On Friday, Japan’s Finance Ministry (MOF) announced that public debt had reached a record 1,008.6 trillion yen at the end of June, amounting to nearly 8 million yen for every Japanese man, woman and child. According to the MOF, the debt figure could even hit 1,107 trillion yen by next March due to government bond issuance to fund public works, including continued reconstruction from the devastating March 2011 disaster. Already at more than 200 percent of gross domestic product, gross public debt would be higher still if the ministry included obligations to government-affiliated organizations and the 200 trillion yen owed by municipalities. Nevertheless, Japan has held the position of the world’s largest creditor nation for 22 straight years, with net overseas assets totalling nearly 300 trillion yen at the end of 2012. Household assets of an estimated 1,500 trillion yen, along with surplus funds from the private sector and demand from Japanese banks, have given the government a large market for bond issues. While economists argued over the impact of planned consumption tax hikes, the government announced that GDP had expanded at an annualized rate of 2.6 percent in the June quarter, below market expectations of a 3.6 percent gain and the previous quarter’s 3.8 percent rise. Households, government and exports added to growth, but corporate capital spending fell for the sixth straight quarter, with inventories and private residential investment also declining. However, importantly for government finances, nominal growth of 2.9 percent exceeded the rise in real (inflation-adjusted) GDP for the first time since the first quarter of 2012. The consumption tax rate is legislated to be raised three percentage points to 8 percent in April 2014, followed by another hike to 10 percent in October 2015. However, Abe has the ability to postpone the added imposts on consumer spending, which accounts for 60 percent of GDP, should he consider the economy too weak. “The economy has been steadily rising since the inauguration of the Abe administration…I’d like to focus on the economy, including implementation of further growth strategies in the fall,” Abe told reporters Monday. According to Reuters, Abe will decide by early October on the tax rises, with government officials having pointed to the latest GDP data and its revision on September 9 as key factors. 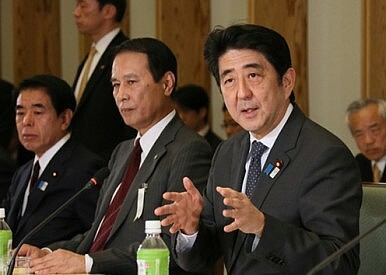 RBS chief economist Japan, Junko Nishioka told The Diplomat that the latest growth figures would not prevent Abe from implementing the planned tax hikes. “The headline figure was weaker than expected, but it was largely depressed by the decline in corporate inventories,” she said. However, the Tokyo-based economist had a warning for officials reconsidering tax increases in the wake of the softer data. “If we assume the economy will no longer get out of deflation, we think further delay of fiscal reconstruction may trigger market fears of a fiscal crisis. However, as long as the BoJ [Bank of Japan] and Abenomics commit to overcoming deflation, it can increase nominal tax revenues and hence force an end to the expansion of fiscal deficits,” she said. While the war against deflation is far from won, the latest GDP deflator data showed the smallest drop in prices since 2009. Consumer prices rose at their fastest pace in four years in June, while the latest BoJ survey showed a 2.2 percent increase in corporate goods prices. Bloomberg data also revealed a doubling of profits by listed companies last quarter from a year earlier, potentially enabling greater investment, dividends and wages. The tide may not have turned yet, but for Abe and his advisers some anxious days lie ahead of the revised GDP data and their critical decision on tax.